1. Approximately 4% of the turtle population in the pond shows the recessive phenotype long nose (nn). What is the frequency of the dominant allele (N) in the population? 2. Approximately 4% of the turtle population in the pond shows the recessive phenotype— long nose (nn). What is the frequency of heterozygotes in the population? 3. Within the squirrel population at park, 16% show the recessive phenotype of a curled tail (tt). What is the frequency of the dominant allele (T) in the population? 4. Within the squirrel population at park, 16% show the recessive phenotype of a curled tail (tt). What is the frequency of heterozygotes in the population? 5. In a population, 600 individuals have MM blood group, 300 have MN blood group, and 100 have NN blood group. What will be the frequencies of M and N alleles in this population? What are the allele frequencies of A and a? 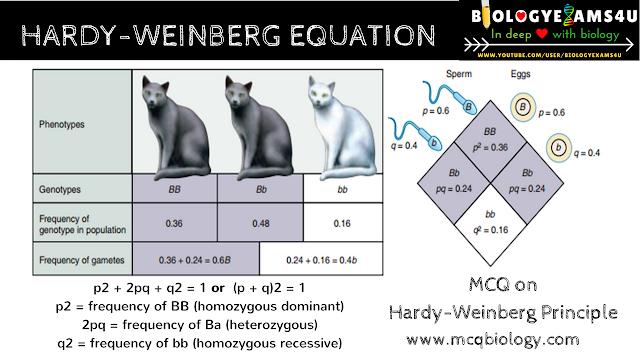 How to solve Hardy Weinberg equilibrium?